You have a wedding or romantic travel. You are in love, romantic honeymoon period is coming to an end, for one last move you want something extraordinary, you need to show yourself with the spectacular side - you are kind, rich, generous, you are the best. To make your girl`s eyes burning and to make her remember how you gave this incredible voyage on the mega catamaran, under sail of dream, love and hope. Even the smallest Lagoon 380 catamaran will approach, and the experience will be like flying to the moon! You can even arrange a wedding right on the yacht! It is unique. Comfortable. Prestigious. There is no girl who doesn't dream of the fantastic prince on the white yacht! We offer you unique romantic voyage by yacht under shouts of seagulls, tempting splash of a wave and cozy whisper of a tender breeze. Seclusion, opening for yourself the new corners of the terrestrial globe, which are created only to be perceived by you. The unusual sea declines spreading on heavenly and sea blue will be pleasing to the eye and will remain in memory for the whole life. Paradise islands and the fairy land will find real lines for you. You will create the exclusive world for yourself. The world surrounded with the sea. If you want to win heart of darling, travel under sail- it is what you need. Closer to reality: The total area of the yacht is 98 sq.m. 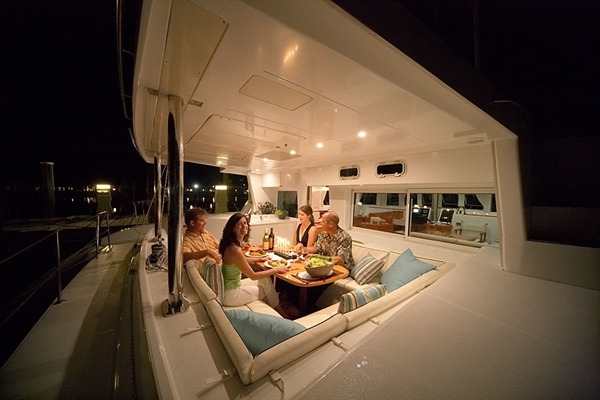 On the yacht it is possible to invite to a banquet or a buffet dinner up to 16 people. You will be able to choose a place for the parking and picnic in the most beautiful, pleasant place. And to have a rest - having retired to a spacious cabin with a double bed. Take pleasure in fantastic lagoons, bays, and desert islands, and we will prepare for you romantic evenings at the best restaurants and hotels. The route of your travel is defined only by you!